MURPHY BROWN’s first revival season comes to an end on Thursday, December 20, as Murphy (Candice Bergen) worries about Avery’s (Jake McDorman) quasi-impromptu trip overseas. 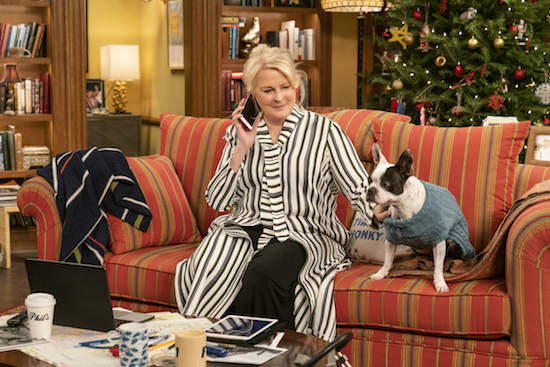 "Happy New Year" - The gang tries to distract Murphy from worrying about Avery's assignment in Kabul by getting her to attend the special 100th anniversary New Year's Eve celebration at Phil's Bar, on the first season finale of the revival of MURPHY BROWN, Thursday, Dec. 20 (9:30-10:00 PM, ET/PT) on the CBS Television Network. Pictured: Candice Bergen as Murphy Brown Photo: David Giesbrecht/CBS ÃÂ©2018 CBS Broadcasting Inc. All Rights Reserved.